Born March 12, 1926 to Robert M. Dinterman, Sr. and Amy L. Dinterman. 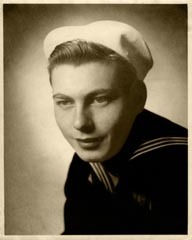 Enlisted in United States Navy on February 8, 1944 at age 17 with parental consent. Assigned to the USS West Virginia May 29, 1944 as a Gunner’s Mate, Seaman, Second Class. Honorably discharged after World War II as a Gunner’s Mate, Seaman, First Class on September 25, 1945 after having served 1 year, 1 month and 3 days in combat. Fought bravely in the Battle of Leyte Gulf, the Philippine Invasion, the Battle of Luzon, Iwo Jima and Okinawa where he manned the guns on Easter Sunday, April 1, 1945 when the “Wee Vee” sustained several casualties when hit by a kamikaze suicide bomber. Married Nita Carmelita Moriarty December 20, 1946 who had moved to Washington, D. C. to support the war effort as well. Supported his family as an expert carpenter for 21 years then worked for the National Park Service for 26 years before retiring in 1992 as a Branch Chief of Construction for National Parks in Washington, D. C. Died November 10, 1999. Devoted father of Ted Robert Dintersmith, Mark Daniel Dinterman, Jean Marie Grinnell, Laura Susan Luca. Proud Father-in-law of Kathleen Dinterman, Lt. Colonel Stephen Grinnell, Jr., Ray Luca and Elizabeth Hazard. Loving grandfather to Katherine and Robert Dinterman, Kristin and Sarah Grinnell, Daniel Luca, Amy Grinnell, Gibson and Sterling Dintersmith, Brian Luca and Stephen Grinnell III. Exemplified “The Greatest Generation” throughout his entire life.